Made with two types of ground beef and loaded with flavor, you’ll never miss the beans in this Slow Cooker Hearty No-Bean Chili! Despite my bitter feelings towards winter (read: it’s been in the negative and single digits here within the past few weeks), I do love that this time of year makes me want to whip up warm and comforting meals. There’s just something about a hearty dinner that fills me up and keeps me satisfied, even if there is three feet of snow outside (ok, so I’m exaggerating just a little). And nothing screams comfort food more to me than chili. I’ve been a chili fanatic for as long as I can remember! The spicy flavor and mixture of meats, veggies, and beans fits perfectly with a hunk of cornbread. And while I’ll eat chili any time of the year, I only make it in the winter. It just seems more appropriate, right? Now enter in the hubster. He loves chili too, though not as much as myself. However, he doesn’t like it with beans. Yep, you heard that right, friends…no beans! It must be a texture type thing, because you really can’t taste the beans once they’re cooked. Am I right? I can’t really blame him, though, because I wouldn’t eat those beans just on their own either, though I do love them in chili! So when we both got a craving for chili years ago, I compromised and made this Slow Cooker Hearty No-Bean Chili. Made with two types of ground beef and loaded with flavor, you’ll never miss the beans in this chili! In fact, this is my favorite chili and I almost prefer it sans the beans. I’ve been making this no bean chili for about five years now, as it’s a staple in my household during the winter. While you can certainly make this on the stove in a little over an hour, I love whipping out my slow cooker for this dish. The flavors blend together and create such a delectable taste. And it makes your house smell wonderful, too! Besides being out-of-this-world good, this crock pot chili with no beans is a breeze to whip up! Because I omitted the beans for the bean-loathing hubster, I used one pound of ground beef and one pound of ground chucks. This makes it extra meaty and definitely makes up for the lack of beans. Of course, you can definitely add in beans if that’s what you prefer, it’s delicious either way! It’s also very easy to customize this chili based on your preferences. You can add in as much or as little chili powder and spice as you would like. I’ve played around with this recipe a lot over the years and found the perfect combination for me. Serve this Slow Cooker Hearty No-Bean Chili with a side of my homemade Skillet Buttermilk Cornbread, and you have yourself a delicious meal, perfect to beat the winter-blahs! In a large skillet, brown and crumble ground beef and ground chuck until cooked through. Drain and add to slow cooker. Add tomato sauce, diced tomatoes, tomato paste, onion, pepper, minced garlic, cayenne pepper, ground cumin, chili powder, white sugar, oregano, salt and pepper to slow cooker. Stir to combine. Serve with shredded cheddar cheese and sour cream, if desired. Sounds like this chili is made for your husband then, Dannii! Thanks for pinning! What if I used half venison and a half ground beef? Hi Terry! I've never tried that so I can't say for sure, but it sounds like it would turn out. Hope you enjoy! Just way way way too much tomatoes, tomato paste, sauce, diced tomatoes. Way too much. It just tastes like a gigantic bowl of tomatoes. Did I mention tomatoes? Sorry to hear that, B.K. I've never had a problem with too many tomatoes, as that is the base of most chilis, so feel free to decrease that if you try this again. So I've done meatless chili before but never only meat chili. This looks so good and it would be perfect for my low-carbing dad! I've never tried a meatless chili, Tori! I bet it's fantastic, though! When it's freezing outside, I can't think of much better! Fantastic recipe, and I love that you can turn it on and leave it alone! My husband would totally love this chili, too! He's been asking for chili for a while... I made a sweet potato chili the other night, but I don't think it was quite what he was hoping for :) This looks delicious! I think most men would love this chili since it has double the meat! :) Thanks for the kind words, Sues! Hearty and robust ~ Gayle this chili looks marvelous. 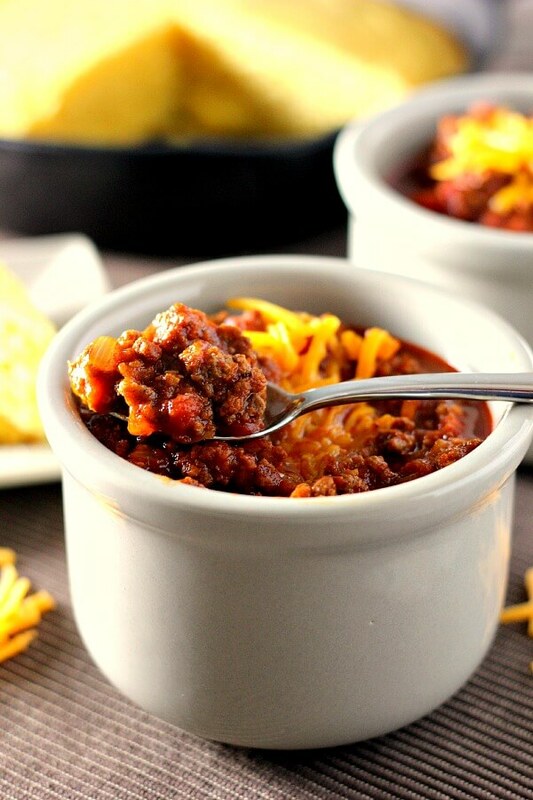 Chili is one of my favorite meals, it's so filling and I love the cheddar you put on top. My favorite. I'm with you on the beans, I don't think one can taste them so I throw them in but funnily enough, my husband and father-in-law hate beans (they say , it um causes stomach issues later, Ha, I won't go into the specifics) so I love your chili recipe that is easy to customize for those picky eaters. Perfect for the super bowl coming up too!!! It must be a texture thing with the beans! Sounds like this would be a great dish for your husband and father-in-law, Laura! Thanks for the kind words! Yes! We totally are on the same wavelength, Sarah! Anyone that loves meat would probably devour this in a heartbeat! I love warming and comforting meals like this during this time of year! My boyfriend also has an aversion to beans which I totally don't get :) He'd go absolutely crazy for this hearty chili! Yummy! It must be a texture thing, because I swear you can't taste the beans in chili! :) Thanks for the kind words, Ceara! I'm not sure about textures but beanless tastes amazing, goes great on chili dogs and chili burgers etc...but the best part is being able to sleep in bed with your significant other cause no beans = no gas! Ooooh! I just made a three bean chili, and I have to say it left me craving a hearty meat chili. Want want want! Chili with double the meat is fantastic, Sarah! Thanks! I don't think I've ever made chili with only meat. I bet my hubs would go completely bonkers over this though, he's a total meat guy! I need to try it! Pinning. I hope your husband loves this chili if he tries it, Jen! My husband goes nuts over this, too. Thanks for the pin, friend! Gosh this looks good! And that little dollop of shredded cheese on top looks like a little burst of sunshine! I'll take it! YESSSS! I crave hearty soups and stews all the time, so bring on the chili!!! This looks so hearty and filling. Stay warm up there, girl. I remember freezing my a** off all the years I lived in PA, and I feel for you!! It's too funny that you're sharing a no-bean beef chili today, because I made a three-bean no-meat chili this weekend! My husband actually prefers to eat vegetarian most nights. I guess I'm lucky in that because I'd rather only eat meat a few times a week as well. I could actually eat it more often than he'd like! 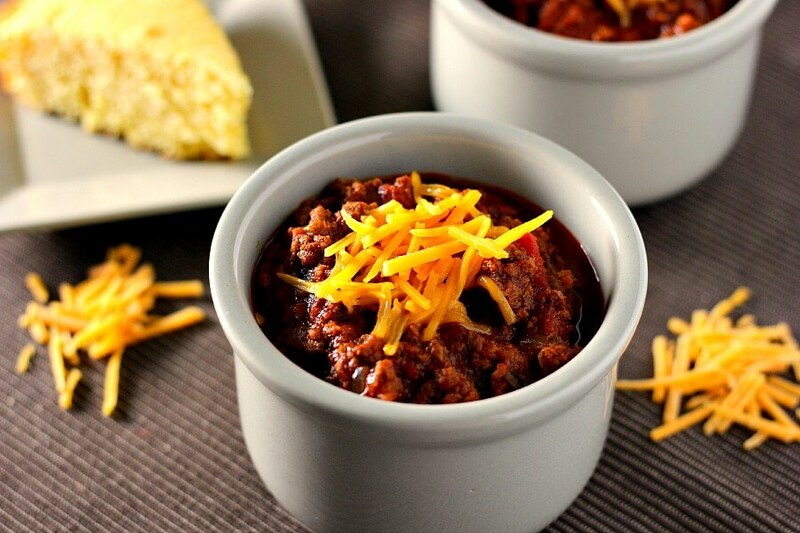 This chili looks delicious, especially with that skillet cornbread! Lovely photos, too! 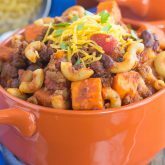 I've never had a no-meat chili before, so I definitely need to try that! I hope you share the recipe, Kristine! :) Thanks so much for the kind words! Gayle, I feel the same way about winter .. ugh. . we just gotta get through it. . bowls and bowls of this chili will help though! I husband would love this. . loaded with ground beef and everything good. . looks great!! This chili will help you forget about winter for just a little bit, right? :) Thanks for the kind words, Alice! Chili is just the perfect dish for the winter, Marcie! Thanks so much for the kind words and pin! Ohhhh I love me some chili! I always crave it whenever I go skiing with my family in the winter since the resorts always sell it at the top of the mountain. 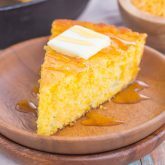 Nothing beats a warm bowl and cornbread after a long day of exercise and chilling winds! Great recipe! Thanks, Christine! Chili is my go-to meal in the winter! So funny your husband doesn't like beans in his chili! What a good wife to make a delicious version that is bean free. It's so cold and rainy here in California today, a bowl of this hearty chili would be just the thing to warm us up! Thanks, Natalie! This chili is my favorite, even sans the beans! Thanks, Olivia! Hope you like it if you try it! Gayle chili with no beans is a meat lover's dream come true!! Looks delicious! Thank you, Ami! It's so full of flavor and hearty with the meat that you'll never miss the beans! I can commiserate with you about the cold weather. I just can't wait until it reaches above 20 degrees! 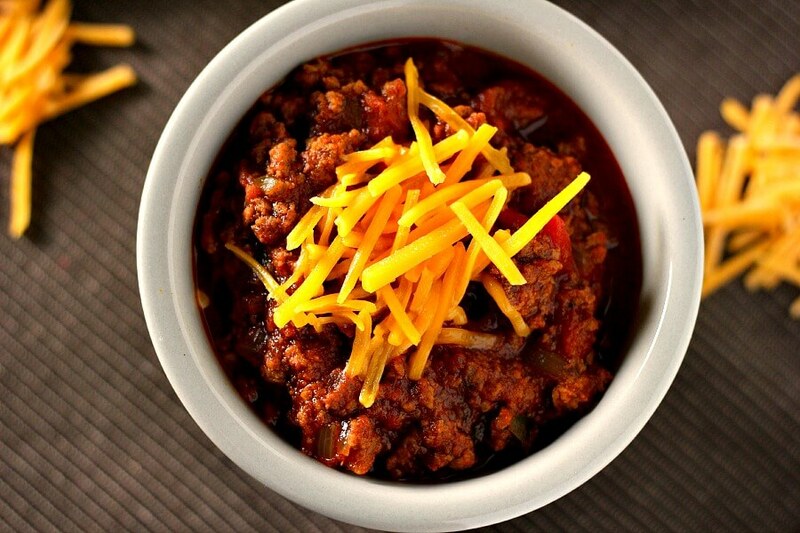 This chili looks amazing and perfect for cold winter days. I love that you didn't add beans (not my favorite in chili) Looks amazing Gayle! Thank you, Kelley! I like beans in my chili, but I have to say that this meat version is my favorite! Sounds like our husbands would get along great, Kelly! :) Thanks so much for the chili love! I love how thick and hearty your chili looks! I agree that not liking beans is a texture thing. My daughter won't go near them and she's really picky about textures of foods. If it feels funny in her mouth, it's a no go. It's so funny how texture can change the taste of food. Thanks for the kind words, Christin! I actually like the idea of no bean chili, double the mead, please :) . And my slow cooker is my best friend, when I decide to make some! Pinning and will definitely try them! Thanks, Mira! I hope you love this chili if you try it! 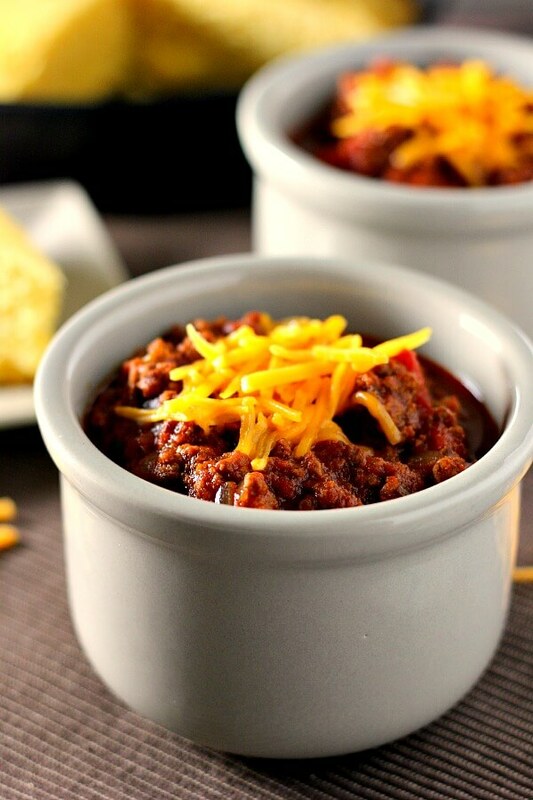 This chili is ALL I am craving right now.. it looks so hearty and comforting. I would love to make this dish but it's summer here in Australia so I have saved the recipe for when it gets cool again! I can't say that I love beans, but I do like them in chili! I think mostly because of all the fiber and protein I know I'm getting. But I don't think they'd ever be missed in this case -- looks incredible! Thank you, Ashley! You would never miss the beans in here! I would love a big bowl of this chili on this cold winter day! I try to make chili at least once a week and need to add this to my menu soon! It definitely hits the spot! Thanks, Ashley! That's exactly the right meal for these cold winter days! I haven't made chili in eons, definitely need to soon. 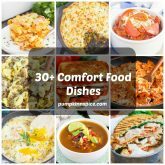 Such a great comfort food in the winter! Isn't chili just perfect for the winter? Thanks, Stacey! I make meatless chili often, and sometimes with chickpeas instead of beans. Never tried meat-only chili!! good one, Gayle! loving the vibrant pictures!! Chickpeas sound like a great addition, Savita! I'll have to try that! Thanks so much for the kind words! I'm with you on the whole winter thing, but I love that I get to cook comfort meals a lot more, chili included. I've never made chili without beans before, but i will certainly have to try this recipe next time Gayle. It looks delicious. Thanks, Kathy! I hope you like this if you try it! There are sooo many great flavours in this chili, Gayle! I'm a bean-lover myself, but I wouldn't say no to a big scoop of this with that beautiful-sounding corn-bread. Oh my goodness Gayle, single and negative digits. I don't even know how I would function. I think its 75 here today in California. Come visit me!! :) The hubby doesn't like beans? Any types or just in his chili. I love the beans :-) !! But this no bean chili looks out of this world delish!! I need this when the weather cools! Pinned! I would love to be in sunny California right now, Cyndi! My husband doesn't like the type of beans that goes in chili, though he does eat green beans. Thanks for the kind words and pin, Cyndi! Whoa, those pics are making me have a serious chili craving! I love to get a big bowl and top it with cheese. Then I get those Fritos Scoops and go to town! Bookmarking this recipe! Oh yum! I love your idea of using fritos with this chili, Leah! Definitely trying that out next time. Thanks for the pin, friend! I'm with you - one of my favorite parts about winter is all the soup / chili I make! My husband would loveeeeee this version! It looks fantastic! Thanks, Ashley! My husband devoured this...definitely a winner in my house! Chili is definitely one of the better parts of cold weather!! 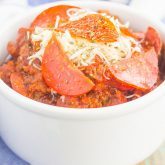 And chili made in the slow cooker is my fave-- so easy! This one sounds delish! Thanks, Jess! This is my favorite dish, too! Double the meat is always good, right?! :) Thanks for the kind words and for stopping by, Melissa! Chili isn't supposed to have beans. It's not chili if there are beans. How many servings do you think this makes? I am hosting a party tomorrow and stumbled upon this when looking for bean-less chili (I too don't understand but lots of my guests don't like beans!). Hi Kari! It serves between 5-6 people. I hope you and your guests love this if you make it! Have this in the crockpot as we speak! My husband is weird about beans too, so this seemed like a recipe I could compromise for! Thanks! I hope you and your husband love this recipe, Cori! It's the only chili my husband will eat, and he loves it! :) Thanks so much for stopping by! I'm so sorry that you didn't like this chili, John! I've made this many times and have always had good success. I think i'm going to be doing the same. It doesn't taste very good at all. I was skeptical about the 58oz of tomato sauce & dadly, rightfully so. It's more like soup than water & very acidic . I even used about 4 tablespoons of corn starch & it's still really watery. Also an oddity, the recipe doesn't call for salt? I'm very sorry this didn't work out for you, Daniel. I have never had an issue with it being watery and have had many positive reviews on this. And as for the salt, with all of the spices and flavor it really isn't needed. That's more of personal preference, so definitely not an oddity. Thanks for stopping by! Thanks, Gayle. Just to clarify - the tomato sauce - that's supposed to be two, 29oz cans and not two 9oz cans? Hi Daniel! Yes, I used two 29 ounce cans of sauce. Since you add two pound of meat and also tomato paste, it should thicken up quite nicely. If your chili was soupy, maybe decrease that by a can? I have never had that problem, though. Thanks! Thank you, Catherine! It's one of my favorite dishes! HI Giving this a try, I had to change it up a little due to my allergies to onion and garlic, we will see how well it is received tonight at the Chili party. Hi Patricia! I hope you love this chili! Please let me know how it turned out for you! HI it came out great! I had a hard time finding black olives from the can so I get the fresh ones from the salad bar. It was a huge hit. I will make it again. I'm so glad you liked it, Patricia! Thanks so much for stopping by and letting me know how it turned out! I Love beans and make a separate pot of them and only add the amount I want when heating the Chile, as it's Always better the next day. I use a Mexican based recipe for the beans which gives them a nice flavor. And besides, now I get Many more servings from this recipe. And without beans this is Perfect for topping my Chile Dog. Thanks for a Great recipe. The temps are hovering around triple digits these last few days, but who cares, Chile is Always Good. PS, I frequently put chopped raw onion on top with the cheese, it gives a nice crunch. Hi Bill! That's a great idea to make a separate pot of beans and add as you like. I'm going to have to try that. And I agree with you, chili is always good, no matter the temperature. Thank you for the kind words and for stopping by! My kids are allergic to legumes/beans, and I never thought of just leaving them out because my husband says chili isn't chili without them! Have this in the crock pot for tonight's supper (first really cold weather we've had) and it smells AMAZING! Hubby says it smells even better than HIS mother's recipe...and that's impressive. Chopped the ground meat super-fine so we can ladle it over pasta. Perfect comfort food! I hope you and your family LOVE this chili, Christy! I do like beans in mine, but I actually prefer this meaty, no-bean version more. Definitely great comfort food and such a good idea to ladle it over pasta. Thanks so much for stopping by and I hope you enjoy! Your chili recipe is in the crock pot as I type - my son doesn't like soup at all, but he LOVES chili (no beans - the apple doesn't fall far from the tree). Smells delicious! Thanks for sharing your recipe! I'm so glad you are trying this recipe, Teresa! I hope you and your son love it. It's my favorite chili and my no-bean loving husband can't get enough of it. Thanks for stopping by to let me know! We are allergic to legumes so this recipe is perfect! Just wondering, how many servings do you estimate for this recipe? I am going to serve this for NYE and need to serve 9 adults and 12 kids. Thanks! Hi Melissa! This serves roughly around 6 people. Hope you love this if you try it and thanks for stopping by! Hi Laura! Thanks so much for stopping by and letting me know how it turned out! I'm so glad you liked this chili. It's one of my favorites, and you don't miss (or need) the beans. Thanks again! First time making chili w/o beans. Needed a change and it turned out really good. Family really enjoyed the spicy flavor w/o having the beans drown it out. Thanks! Hi, Carole! I am so gad this chili turned out well for you. It's definitely nice for a change and is one of my favorite meals. Thanks for stopping by and letting me know how it turned out! I was slightly confused about the amount of tomato sauce to use, seemed like a lot. I couldn't find 29 oz cans at my local Kroger so I used 4 (15 oz) cans. I was pretty excited about this but after making it, I was a little disappointed. I felt it had potential to be really good. Mine wasn't soupy but it was definitely way too much tomato sauce. I think I'm gonna try it again with just two (15 oz) cans of tomato sauce. Thanks for posting the recipe though. Hi Mike! So sorry to hear it didn't turn out for you. I've never had a problem with the consistency. Have a great day! Hey Gayle- My kids won't touch a kidney bean so this recipe was just what I was looking for. Since my previous attempts at chili all Came from a can (don't judge me :) ) we were all happy to have a home made flavorful Bowl of chili. I had a 'soupy' problem as well so I think I'll cut down on a can of sauce next time, but otherwise this is a great recipe. Thanks! Hi Connie! I'm so glad you enjoyed this recipe. Sorry it turned out soupy for you, but hopefully it will be better if you try it again. Thanks so much for stopping by and letting me know how it turned out! This recipe looks fabulous. Would I need to change anything to the cook time or amount of meat used if I was to use ground turkey instead of beef? I am so glad you loved this, Kimberly! I've never used ground turkey before, but I think it would most likely cook the same amount of time. Thanks for stopping by and letting me know how it turned out! I love this recipe! I never put beans in my chili(UGH) but never thought about double the meat. I use two cans of chili ready tomatoes,a whole onion chopped, garlic, 2 Tbsp chili powder, 2 tsp cumin, and 1 15 oz can tomato sauce. This sounds very good and will use next time I want chili. I also like the idea of a pot of beans for the ones who want them. Yeah, all taken care of. Hi Rebecca! Sounds like you would love this! Hope you enjoy! Is it two 29 oz cans of Tomatoes sauce or 29 oz. total sauce. ? Hi Tammy! It's two cans total, so each can is 29 ounces. Hope this helps! Wow thanks for getting back to me so quickly! I made it tonight and it made soooo much I wanted to make sure I used the right amount. It was so yummy! My picky son loved it. I will add beans to the leftovers tomorrow for him. He likes beans, I don't. Thanks for the recipe and the quick rely. You're very welcome, Tammy! It does make a lot but it's good for leftovers! Great idea to add beans in, too. Thanks again for stopping by and letting me know how it turned out. Have a good night! I'm anxious to try this as it's for our youth fund raiser. Approximately how many ounces will this make? I have a large crock pot so I might have to double it. I'm not the only one making chili but have to provide a no-bean type and this looks good. HI Terry! This sounds perfect for a fund raiser! I don't know how many ounces it makes, but it does make a lot. I would say it easily feeds 6-8 people. Hope you enjoy this if you try it! I SO appreciate this recipe. For my family, it isn't a taste/texture issue with beans...It's an allergy! My husband is allergic to beans. They cause his throat to start swelling shut. I have this recipe in my crockpot right now, and I can't wait to try it tonight. I really hope you and your family love this recipe, Gretchen! It's requested by my husband all the time. Thanks so much for stopping by! Have a great night! Hi Gayle ! I bought all the ingredients for this and was going to make it tonight and realized it’s for a crockpot. Do you think I could do it over the stove stop ? Or would that ruin it Thank you !! Hi Samantha! You could definitely do this on the stove top! I'm not quite sure of the cooking time since I haven't done that before, but I would follow the instructions listed and then maybe simmer for an hour or so for flavor. Just a guess! Hope you love this and thanks for stopping by! Hi Gayle, I have this in the crockpot right now! It has become a New Year's Eve tradition for my family. Thank you so much for sharing this yummy chili recipe!! Hi Kelly! I'm so happy to hear that! Sounds like such a wonderful tradition. Thank you so much for letting me know, I appreciate it! Happy New Year to you and your family! Hi! This recipe sounds delicious! I was wondering if you mean a bell pepper or a jalapeño pepper for the green pepper? Thank you! Hi Liz! I mean green bell pepper...I will update the instructions if that makes it clearer. Hope you enjoy! Hello, I plan to triple this recipe for a party and plan to use only ground beef. Do you foresee any problems with this or have any suggestions? Thank you. Hi Gayle! Have you ever browned the meat the night before? Trying to save time before tomorrow's Super Bowl party. Thanks! I’ve done this recipe before and planning to do it again this weekend. My fiancé can’t do beans and definitely love meat so this is an absolute perfect recipe. Easy and delicious! Thank you for sharing! I'm so glad you and your fiance love this recipe, Anna! My husband doesn't like beans in his chili either, so he loves this. Thanks so much for stopping by and letting me know how it turned out! I made it tonight. It was really good. I've never made it without beans before. I did leave out 1 tblspn of the chili powder. Since it was the first time doing it I was a little worried about 6 tablespoons. The 5 were fine. 6 probably would have been even better. I also forgot to get a green pepper at the grocery store. That probably would have made it even better, but it was fine without it. My husband kept saying it looked like spaghetti sauce. Which it did. He said he'd be fine with beans next time, but it was good without them. Thank you for a good recipe! It's always scary trying something new. Especially since I didn't see a lot of comments with people that actually made it and adjusting this or that. You really don't need to. It's totally fine the way it is. I also had cornbread. I like to put it in the bottom of the bowl with the chili on top. Not your recipe, but I think I'll try that next time. And I did put cheese and sour cream on top. Yum! Once again, thanks! And BTW it makes a lot. So with just my husband and I we have a lot left over. Lots to take to work for lunch! Thanks again! Hi Krista! I'm so glad you liked this recipe! Cornbread is delicious with this, that's how I like to eat it, too. Thanks for stopping by and letting me know how it turned out! After I made this I can't wait to try more of your recipes! I'm so glad to hear that, Krista! I hope you enjoy whatever you try! Have a great day! I’ve made this half a dozen times and I LOVE it!!! It’s perfect for a bean hater like me ???? the taste is phenomenal and the spice is perfect. Seriously the best “no bean” chili I’ve ever had or made. Thank you!! Hello! I'm interested in trying this recipe but wondered if any readers have tried making it without the diced tomatoes. Any suggestions as to what I could substitute for the diced tomatoes? Hi Lisa! You could definitely omit the diced tomatoes if you prefer. I haven't tried that before, but I would think that regular tomatoes, diced would work, or just not using them at all. Hope you enjoy this if you try it and thanks for stopping by! Thank you so much for your reply Gayle. If I omitted the diced tomatoes completely, would I need to add more of anything else? Hi Lisa! I don't think you would need to add anything else in place of the diced tomatoes, as it really just adds more texture to the dish. The consistency should still be the same. If you try it this way, please let me know how it turned out! I made this last night....turned out amazing!! I don't read directions carefully and bought 2 14oz cans of tomato sauce instead of 2 (29 ounce) cans tomato sauce, but it still worked! And I threw in a little quinoa to thicken it up- and get that super grain in there! I'm so glad you loved this, Andrea! Such a great idea to add in some quinoa! Thanks so much for stopping by and letting me know how this turned out! I don't stomach green peppers, or any peppers for that matter, very much. Would it make a huge difference if the pepper was left out of the recipe? Otherwise it sounds like it would be really good! Hi Rebecca! No, not at all! I sometimes leave the peppers out because my husband doesn't like them and I notice no difference. Hope you like this if you try it! I love this recipe. I make it for myself more than my wife would like (she likes variety) but I've made this recipe as my base. I triple the meat with 1 lb beef and 2 lbs ground pork. I also leave out the second can of tomato sauce and replace with an extra can of diced tomatoes. It turns out perfect for me! I'm so glad to hear that, Ryan! Sounds like a great idea to triple the meat and use an extra can of diced tomatoes instead! Thanks for stopping by and letting me know how it turned out! I'm on about my 5th batch of making this delicious chili!!! I don't vary much, maybe a little garlic powder, along with clove of garlic...I also add frozen corn, just to bulk it up, making it even more filling, since I don't like beans at all, in chili!! I try to tell my partner at work about it and she basically says, girl, that ain't chili then!!! Lol....I tell her how filling, and chunky it still turns out, and dee-lish!! To each their own! Imo, it's not too many tomato'ish produce to use in the recipe....So glad I came across your recipe!! And I bring my lunch to work daily, so I can easily have this 5-6 days in a row, without getting sick of it!!! I'm so glad you enjoy this, Andrea! Corn is a great addition! This is my favorite chili too...so good for leftovers! Thanks so much for stopping by and letting me know how it turned out!